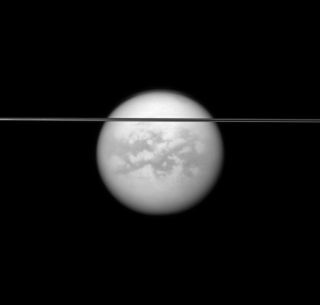 NASA's Cassini spacecraft captured this view of Saturn's largest moon, Titan, with Saturn's rings in the foreground. The dense atmosphere roiling on Saturn's largest moon, Titan, may come from organic material baking in the moon's interior. Titan fascinates scientists because of its thick atmosphere — which is mostly made of nitrogen gas — and its liquid methane and ethane oceans. Its atmosphere is thicker than Earth's, and it's the only other solar system body with large amounts of liquid on its surface. "A lot of organic chemistry is no doubt happening on Titan, so it's an undeniable source of curiosity," Kelly Miller, a researcher at Southwest Research Institute in Boulder, Colorado, and lead author on the new work, said in a statement. "Because Titan is the only moon in our solar system with a substantial atmosphere, scientists have wondered for a long time what its source was," Miller said. "The main theory has been that ammonia ice from comets was converted, by impacts or photochemistry, into nitrogen to form Titan's atmosphere. While that may still be an important process, it neglects the effects of what we now know is a very substantial portion of comets: complex organic material." The composition of Titan's atmosphere didn't quite match up with the types of nitrogen and other material found in comets. Plus, the 5 percent of Titan's atmosphere made of methane raised another question: It reacts quickly to form organics that would fall to the surface, so how is it replenished? Miller's group considered data that the Rosetta spacecraft gathered about the comet 67P/Churyumov-Gerasimenko, which revealed that the comet was half ice, a quarter rock and a quarter organic material, according to the statement. Those materials, present in the early solar system, could have built Titan as well. "Comets and primitive bodies in the outer solar system are really interesting because they're thought to be leftover building blocks of the solar system," Miller said. "Those small bodies could be incorporated into larger bodies, like Titan, and the dense, organic-rich rocky material could be found in its core." Data from three of Cassini's Titan flybys form these mosaics of the object, which show the moon's dense atmosphere obscuring its surface. And, according to Miller's calculations, this type of organic material in comets, if it were at the core of Titan, could produce gases similar to the moon's atmosphere today. Thermal models of the moon's interior suggest a toasty environment that could replenish or even generate much of Titan's atmosphere. "If you cook something, it will produce gases," Miller said. Approximately half Titan's nitrogen atmosphere, and all of the methane, could come from organics baking in the moon's warm interior, according to the statement. The new work was detailed Jan. 22 in The Astrophysical Journal.